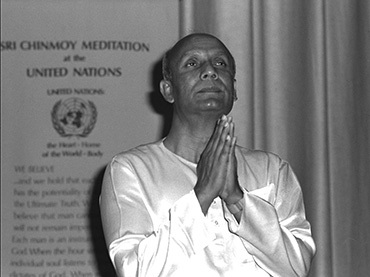 Sri Chinmoy has led the Peace Meditation at the UN (1970-2007) at the invitation of UN Secretary-General U-Thant. 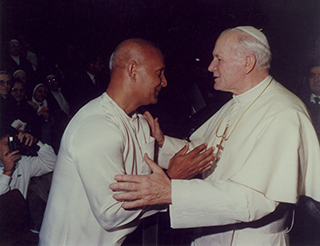 Twice weekly he had been meeting with delegates and staff of all nationalities and faith at UN Headquarters in New York for precious moments of silence dedicated to world peace. 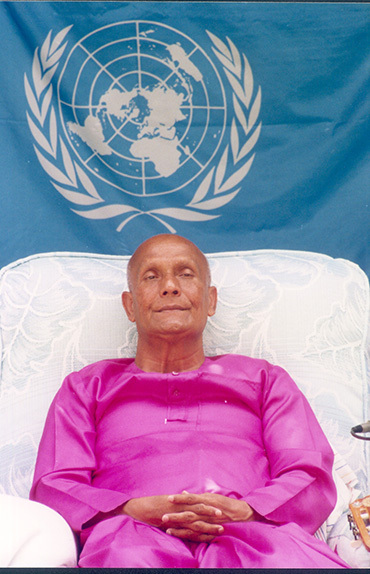 The Peace Meditations honor the highest spiritual aims of the UN. “Whoever speaks to me about you is all appreciation and admiration, and I personally feel that you have been doing a most significant task for the United Nations. for progress of their countries and service to their countrymen. In you our Lord’s God-Vision thrives. Our beloved President Mandela, O Supreme Pilot of the South Africa-Boat, it is here in this tinier than the tiniest room that you embodied your beloved country’s streaming tears and bleeding heart. 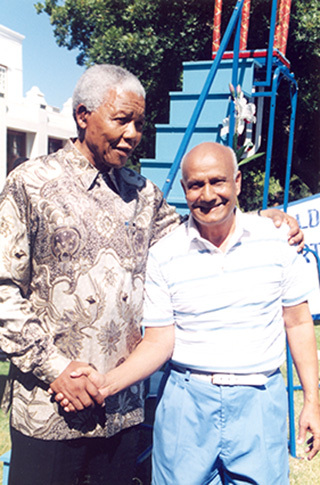 From Sri Chinmoy’s prayer offered on his visit to President Mandela’s prison cell in Robben Island. High Heaven’s Smile and earth’s solace-dream. Your heart has won the world’s admiration-choice. The liberator-sun of the world’s division-night. 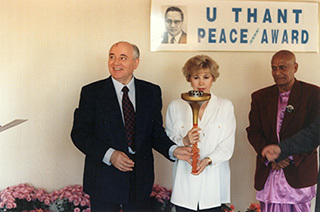 Gorbachev, Gorbachev, all-where, the peace-blossom-tree. 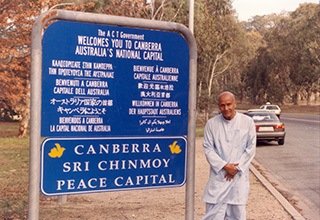 Over 1100 landmarks around the globe have been dedicated to the cause of world peace as the part of the Sri Chinmoy Peace-Blossom programme. 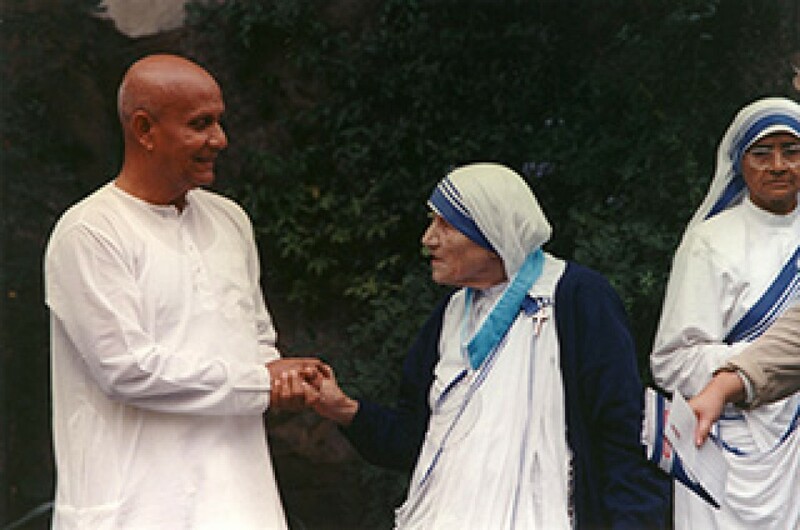 It also includes over 160 Nations, whose leaders proclaimed values of peace and oneness on national level. 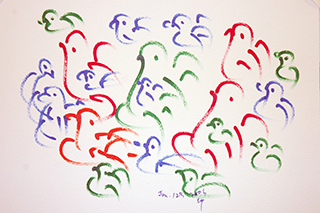 The Peace-Blossom programme is a unique and highly effective way to join citizens on a grassroots level in a universal and positive expression for world friendship and peace.